The Moldovan parliamentary elections in late February was an election that broke many records. The new parliament is the youngest ever (average age 42) and most gender balanced (26% women) in the country’s history. However, most other indicators were negative. The turnout, 50.57%, was the lowest in Moldova’s independent history, due in part to new bans on voting with expired passports and even valid national IDs for Moldovans living abroad. It was also by-product of the political alienation resulting from the cancelling of the Chisinau mayoral election results last summer. Yet, growing absenteeism is also an indication that people are losing whatever trust they had left in the political elite, especially considering that one of the key perpetrators of the infamous $1bn bank fraud, Ilan Shor, became a member of parliament – despite court convictions for fraud and a seven-year prison sentence; Shor and his allies won seven parliamentary seats in these elections. The centre-right Block ACUM DA-PAS took 26; the incumbent Democratic Party held onto 30; the Socialists with 35; and three independents became MPs. In light of a controversial change from a proportional to a mixed electoral system, similar to those implemented in Georgia and Ukraine, the election saw a new high of international observers. That higher level of scrutiny revealed an unflattering image of the Moldovan election environment. The OSCE ODIHR preliminary report noted that “the campaign was tainted by allegations pressure on public employees, strong indications of vote buying and the misuse of state resources.” The PACE delegation stated that “the new electoral system regrettably confirmed the main concerns raised by the Venice Commission: lack of effective mechanisms to prevent undue influence by wealthy businesspeople, combined with a poor system of supervision of party and candidate funding, and inadequate penalties.” And according to independent watchdog Promo-LEX, there were over 1,000 violations. Yet, the bleak assessments from over 100 international observers hardly do justice to the full scale of the fraud. Although mentioned in their reports, authorities refused to investigate violations and, therefore, no one has been sanctioned. The Central Electoral Commission even turned a blind eye on a statement issued by Facebook confirming that about $20,000 were spent on advertisements in favour of Moldova’s ruling Democratic Party, which failed to include the expenses in its financial report. Notably, the electoral corruption associated with 37,000 voters bussed in from breakaway Transnistria is difficult to deny or ignore, given the numerous media accounts. 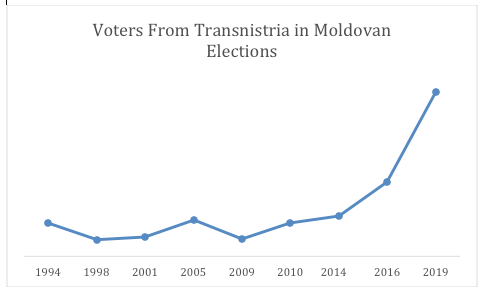 While nearly two-thirds of the approximately 300,000 Transnistrian residents are indeed Moldovan citizens, their long-time separation from the broader national political environment – and the conditions of that separation – suggests an active campaign of vote-buying. This is particularly troubling because it’s a problem that seems to be getting progressively worse. While the population of Moldovan citizens in Transnistria is decreasing, the turnout in Moldovan elections is somehow rapidly growing. This election’s figures are more than double the roughly 17,000 Transnistrian residents bussed in during the 2016 presidential election. That number, in turn, was almost double the approximately 9,000 from the 2014 parliamentary elections. In the previous six elections in the 1990s and 2000s, the turnout from Transnistria oscillated between 4,000 and 8,000. If Transnistrian separatist authorities continue to find common ground with the national Moldovan government, the number of votes from Transnsitria in Moldovan elections could increase further. On the surface, this might be considered a positive trend for inclusion, but in reality this is an indication of how corrupt elites on both sides of the conflict have found yet another way to capitalize on the division. One could call this peculiar trend to be a kind of “electoral monetization” of separatism. In all likelihood, the vast majority of those 37,000 Transnistrian residents who voted had little to no idea about the candidates or parties running, as campaigning was not permitted in the separatist region. According to video reports, voters from Transnistria were told specifically for whom to vote in exchange for about $20. In that sense, it is no surprise that two completely unknown candidates won in the 47th and 48th single member districts designated for Transnistrian residents. These candidates are believed to be associated with Ilan Sor, a protégé of oligarch Vladimir Plahotniuc, the Chairman of the ruling Democratic Party. Despite common knowledge that Transnistria is controlled by Russia, somehow voters from Transnistria primarily backed candidates associated with Plahotniuc, a nominally anti-Russian figure. Corruption, it seems, trumps geopolitics. The same logic is likely to play out in the Ukrainian presidential election. Plahotniuc is known to have a good relationship with Ukrainian President Petro Poroshenko. Both Poroshenko and Plahotniuc have enormous leverage over the ruling elites in Transnistria, given the joint border control that can effectively seal off Transnistria. Numerous reports show that Ukrainian citizens residing in Transnsitria were provided free transportation to polling stations in Moldova proper (to the Ukrainian embassy in Chisinau and the consulate in Balti). Just like the effort in Moldovan elections, this logistical operation would be impossible without the cooperation of both Moldovan and Transnistrian authorities. Thus, Poroshenko – another anti-Russian figure – does not shy away from capitalizing on the misery of people living in the pro-Russian separatist enclave, even if the number of votes is too small to make any difference. Yet, for future Moldovan elections, one can only imagine how many votes are going to be bought in Transnistria next time and what effect this is going to have on the Moldovan political landscape going forward. The implications for other countries in the region that are battling separatism also raise questions. Note: This article is part of EDSN fellowship. EDSN is an international research fellowship project of the Center of Social Sciences, Tbilisi, and made possible with the support of the National Endowment for Democracy. The original can be found here.